Originally published under the title, "Muslim Persecution of Christians: A Centuries Old Phenomenon." Thousands of Coptic churches in Egypt have been burned to the ground since Islam conquered Egypt nearly 14 centuries ago. 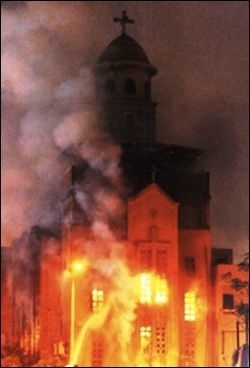 The one glaring fact concerning the persecution of approximately 100 million Christians around the world today is that the overwhelming majority of it is being committed by Muslims of all races, nationalities, languages, and socio-political circumstances: Muslims from among America's allies (Saudi Arabia) and from its enemies (Iran); Muslims from economically rich nations (Qatar) and from poor nations (Somalia and Yemen); Muslims from "Islamic republic" nations (Afghanistan) and from "moderate" nations (Malaysia and Indonesia); Muslims from nations rescued by America (Kuwait) and Muslims from nations claiming "grievances" against the U.S. (fill in the blank __). This fact is underscored in Open Doors' recent 2015 World Watch List—a report that highlights and ranks the 50 worst nations persecuting Christians. It finds that "Islamic extremism" is the main source of persecution in 40 of the top 50 countries—that is, 80 percent of the nations where Christians are persecuted are Muslim. As for the top ten worst countries persecuting Christians, nine of them are Muslim-majority—that is, 90 percent of nations where Christians experience "extreme persecution" are Muslim. Of the ten worst countries persecuting Christians, nine are Muslim-majority. Still, considering that the 2015 World Watch List ranks North Korea—non-Islamic, communist—as the number one worst persecutor of Christians, why belabor the religious identity of Muslims? Surely Christian persecution is not intrinsic to the Islamic world, but is a product of repressive regimes and other socio-economic factors—as the North Korean example suggests and as many analysts and media maintain? Here we come to some critically important but blurred distinctions. While Christians are indeed suffering extreme persecution in North Korea, these fall into the realm of the temporal and aberrant. Something as simple as overthrowing the North Korean regime would likely end persecution there overnight—just as the fall of Communist Soviet Union saw religious persecution come to a quick close. In the Islamic world, however, a similar scenario would not alleviate the sufferings of Christians by an iota. Quite the opposite; where dictators fall (often thanks to U.S. intervention)—Saddam in Iraq, Qaddafi in Libya, and ongoing attempts against Assad in Syria—Christian persecution dramatically rises. Today Iraq is the third worst nation in the world in which to be Christian, Syria fourth, and Libya 13th. Muslim persecution of Christians is perennial, existential, and far transcends this or that regime or ruler. The reason for this dichotomy is that Christian persecution by non-Muslims (mostly communists) is often rooted in a particular regime. Conversely, Muslim persecution of Christians is perennial, existential, and far transcends this or that regime or ruler. It is part and parcel of the history, doctrines, and socio-political makeup of Islam—hence its tenacity; hence its ubiquity. Moreover, atheistic communism is a relatively new phenomenon—about a century old—and, over the years, its rule (if not variants of its ideology) has greatly waned, so that only a handful of nations today are communist. On the other hand, Muslim persecution of Christians is as old as Islam. It is a well-documented, even if suppressed, history. To further understand the differences between temporal and existential persecution, consider Russia. Under communism, its own Christians were grossly persecuted; yet today, after the fall of the USSR, Russia is again reclaiming its Orthodox Christian heritage (and is prominent among Western nations for showing support for persecuted Christians). Time, however, is not on the side of Christians living amid Muslims; quite the opposite. The histories compiled by objective, medieval Muslims make abundantly clear that century after century of religious persecution and discrimination is responsible for transforming territory that in the seventh century made up half of the Christian world—Egypt, Syria, Turkey, North Africa—into what is today casually called the "Muslim world." One example: in Taqi al-Din al-Maqrizi's (d. 1442) authoritative history of Egypt—which was a major center of Christianity before Islam invaded—anecdote after anecdote is recorded of Muslims burning churches, slaughtering Christians, enslaving their women and children. The only escape then—and even today, as groups like the Islamic State make clear—was for Christians to convert to Islam. After recording one particularly egregious bout of persecution, where reportedly some 30,000 churches in Egypt and Syria were destroyed, the pious Muslim historian concludes: "Under these circumstances a great many Christians became Muslims." Patterns of Christian persecution throughout the Muslim world today are often identical to those from centuries past. In short, Muslim persecution of Christians exists in 40 nations today as part of a continuum—or "tradition"—that started nearly 14 centuries ago. As I document in Crucified Again: Exposing Islam's New War on Christians (where al-Maqrizi's anecdotes are referenced, pgs. 39-41), the very same patterns of Christian persecution prevalent throughout the Muslim world today are often identical to those from centuries past. A final consideration: North Korea, the one non-Muslim nation making the top ten worst persecutors list, is governed by what is widely seen as an unbalanced megalomaniac; conversely, the other nine nations are not dominated by any "cults-of-personalities" and are variously governed, including through parliamentarian democracies (Iraq), republics (Nigeria, Pakistan, Somalia, Sudan, Syria), Islamic republics (Afghanistan, Iran), one-party states (Eritrea), and monarchies (Saudi Arabia, ranked 12). The common denominator is that they are all Islamic nations. Thus, long after North Korea's psychotic Kim Jong-Un has gone the way of the dodo, tens of millions of Christians and other "infidels"—short of a miracle, either from Western intervention or true Islamic reformation—will continue to suffer extreme persecution, till what started in the seventh century reaches fruition and the entire Islamic world becomes "infidel" free.